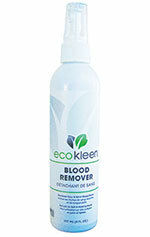 Eco Kleen Blood Remover is a must for blood stains on clothing, carpets, bedding, upholstery, and other surfaces. Our specialized formula goes to work to break down the components of blood and aid in removing blood stains. Note: It is not a disinfectant and will not kill undesirable microorganisms that may be contained in blood. Пример анализа и прогноза трафика на сайт по запросу. эта Веб студия Всайте: Создание сайтов любой сложности. Разработка, поддержка, продвижение.